Paul Zimet and Rae C Wright in This Was The End. Photo by Brian Rogers. 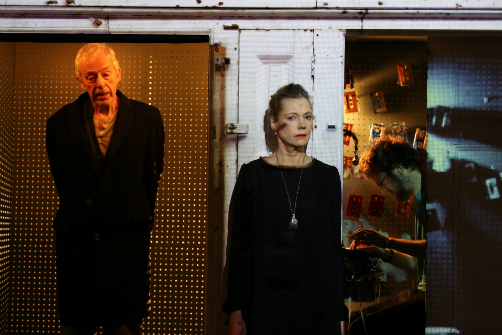 BOTTOM LINE: A deconstruction of Uncle Vanya using video projections, where the past and present are in dialogue over aging and the perception of time. Like our review for Seagullmachine, another play that was a dialogue of sorts, we decided to write this review in dialogue form. Ran Xia: This Was The End is the deconstruction of a classic, one that focuses more on the relationship between the core characters from Uncle Vanya, rather than what happens in the play. Ran: “Vanya (Paul Zimet) loves Yelena (Rae C Wright); Sonya (Black-Eyed Susan) loves Astrov (Jim Himelsbach); Yelena married the professor.” (That last is Sonya’s father, who isn’t present in this production). These are the only facts presented to the audience as the “essence,” the only thing we need to know to follow the plot. Asya: I don’t think that the plot matters much in this case. Uncle Vanya is only a starting point, an inspiration, and ultimately a contextual frame to talk about time, aging, and the end of life. Or the ends? Apparently there can be multiple, as this production shows. Ran: However, as someone who’s already familiar with Uncle Vanya and didn’t need a recap, I was leery of the accessibility of this production. I'm not sure it would be as accessible to those who don't know Chekhov. Since none of the characters gets an establishment scene, the storytelling, or the lack thereof, stood out to me. Asya: Certainly those who are unfamiliar with Chekhov’s text will have a different experience, but they won’t necessarily be at disadvantage. There is always a pleasure in recognizing the source and being able to see how the creators of the new piece read the original. But there is an equal pleasure in tripping in the unknown with the little context that you are provided. And I feel like This Was The End successfully caters to both audiences. Ran: What the production attempts to explore is the perception of time, à la Proust’s notion: the convergence of the past and the present. And I think it is successful due to the clever design elements. The use of echoing is consistent across departments. Thanks to a hidden tape DJ (G Lucas Crane), fragments of texts from Vanya are played out from cassette tapes throughout the show, as the actors speak over the recording half a beat behind the tape. You hear both layers of voices, as if the present is repeating a memory. So when we get to Sonya’s famous monologue “we shall rejoice and look back upon our sorrow here; a tender smile—and—we shall rest”—one of the only times in this production when the text is spoken by a live actor alone—it’s all the more powerful. Asya: Video (by Keith Skretch), projected onto a wall made of sliding panels, also supports the idea of duality. Throughout the show we see two “casts,” both live actors and their pre-recorded video projections. Actors go in and out of sync with their “digital ghosts,” chasing them or getting replaced by them. This Was The End is a great example of how video art can be fully integrated into performance. Ran: Exactly—the opening sequence is gripping with the use of projections. The entire set pulsates like a boombox before opening up to introduce Sonya, the first person to step out through the sliding door. At one point I was even wondering whether the whole set is a hologram, or if there is indeed a solid set (Peter Ksander). It's the latter, and it's made out of a piece of wall preserved from the original Mabou Mines theatre. And having a piece of the company's literal past further compounds the weight of the Proustian concept of “lost time.” One of the most haunting scenes is when Sonya, Vanya, Yelena, and Astrov sit against the wall, and in a moment of solemnity, look as if they are making eye contact with projections of themselves—a true dialogue between the past and the present. Asya: And this is not just some abstract “past” of a 19th-century Russian estate, but the immediate past of these very actors playing those characters. Sonya, Vanya, Astrov and Elena look like residents of a retirement home—abandoned, lost in their memories, and bound to perform the roles they have already committed themselves to for the rest of their life. And maybe it is a total coincidence, but G. Lucas Crane's green t-shirt reminded me of scrubs. Ran: This sense of as retirement home might be because of the age of the characters. One of the most important features of this production is that all four characters from Uncle Vanya are performed by actors over the age of 60, which enhances the storytelling. Black-Eyed Susan delivers a perfect blend of someone who’s been stuck in the role of a “wallflower,” but also has a quiet strength. It’s a very different experience seeing older actors perform as these recognizable characters who have suffered the passage of time. Asya: I think there is not enough compelling talk about aging in theater. The tone is usually either tragic (King Lear-esque pathos of descending into darkness) or cheery (“It’s never too late for anything”). This Was The End is sincere about aging, and the desperation harvested from Uncle Vanya is bone-chilling. Ran: I was also moved by how the characters are portrayed here. It’s heartbreaking to witness the inevitable etchings of time, but at the same time, there is no lack of humor and delight. And perhaps it is this juxtaposition that makes the tragedy more pronounced. This Was The End is created and directed by Mallory Catlett, based on Uncle Vanya by Anton Chekhov. Set Design by Peter Ksander. Video by Keith Skretch. Lighting Design by Chris Kuhl. Live Sound Score and Video Manipulation by G. Lucas Crane. Costume Design by Oliver Gajic. Interaction Design by Ryan Holsopple. Choreography by Johanna Meyer. Tech Director is Bill Kennedy. Production Stage Manager is Kelly Allen. Stage Manager is Courtney Golden. The cast is Black-Eyed Susan, James Himelsbach, Rae C. Wright, and Paul Zimet.